The temperature finally started to make a downward turn over the weekend, and it looks like the 90-100 degree days of summer may finally be behind us. The cooler days and night and low humidity should made our cows much more comfortable, which in turn should lead to more grazing and milk production. But the weather isn't all good news for us. Even after this Sunday's quarter-inch, we are about 10 inches year-to-date below our typical rainfall. Right now the weather forecast is calling for 0% chance of rain over the next 10 days. Our summer grasses have slowed/stopped their growth a couple of weeks earlier than normal due to the lack of moisture, and we won't plant our cool-season forages until we get enough rainfall to soften the ground. I've been busy fertilizing some of our cropland, though, and by the end of the day we should have 75 acres needing nothing more than seeds and rain. Back to the milking herd for a minute. Over the weekend we dipped down to 172 cows in milk, which was probably our lowest point in over a year. We've had a few heifers calve over the past couple of days though and will be up to at least 176 this afternoon. We also have 3 pregnant cows to dry off, but our calvings should begin to outnumber our dry-offs over the next several weeks. Have a "dairy" good day, everyone! Even though it is now technically "Fall", the continued dry weather and heat would certainly make a person think it's still summertime. Our milking cows are still coming to cool in the barns by mid-morning, the bermudagrass in our pastures is starting to fade away, and our tall fescue has yet to begin its autumn growth-spurt. We've decided to move some of our larger animals off of some heavily grazed and drought-stressed land and onto greener pastures...literally. We consolidated a group of pregnant heifers and dry cows (all due to calve after the first half of November) this morning into a pasture that includes a 20 acre hay field that was attacked by armyworms a couple of weeks ago. That bermudagrass won't grow back enough to justify cutting it for hay, but it has thickened up enough to make for some good grazing. There is a 10 acre field of sudex regrowth adjacent to the pasture that will also available for grazing for another 2-3 weeks. Speaking of sudex, the weather has been ideal for curing it into hay. I mowed six acres of regrowth in a grazing paddock (that hasn't been grazed lately) on Monday and flipped it today with the hay rake. It should be ready to bale early tomorrow afternoon and will be fed to heifers or dry cows this winter. If the current weather forecast holds we should be getting a break from the heat and maybe a little rain early next week. If so, it will be good for our cows and certainly for our pastures, and it will move us a little closer to planting our cool-season forages like rye, oats, and ryegrass. Don't forget our Edopt-a-Cow program, and have a "dairy" good day! Yesterday afternoon we baled what will probably be the last of our bermudagrass hay of the summer. With that in mind, I decided I should try to get a few minutes of video before the baler finished it's duty for the season. As I filmed my father harvesting the last few acres, I was trying to decide whether or not to piece the clips together and make another "MooTube Minute", a "Vocowbulary" video, or just store it away as archived footage. Then, out of nowhere, the old Garth Brooks song "The Thunder Rolls" popped into my head. By now you can probably see where this is going. It didn't take very long for the song title to morph into something else, and by the time I shut off the camera I pretty much knew what I wanted to do with the video clips. 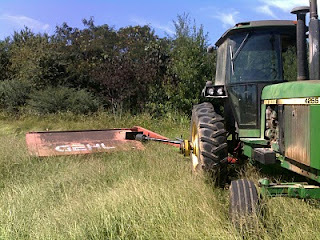 By the end of the evening I had thought up and recorded a full set of lyrics and pieced them together with video clips and still photos related to growing and harvesting bermudagrass hay. The end result is an off-key, amateurishly edited music video called "The Baler Rolls: a song about baling hay." I've posted a few songs on our YouTube account before. Some are more educational than others, some are sillier than others, but they're all done in an attempt to entertain you. You may not learn much from this or any of my farm songs, but I hope you get a chuckle and will keep coming back to watch all of our farm videos. Three thirty in the evening, the sun is shining bright. The hayfield’s ready for a baling, the windrows are raked up tight. Veil of dust on the windshield from the hay that’s going in. The tractor runs across the field then turns and comes again. And the baler rolls. And the baler rolls. It was only three days ago we mowed the Bermuda down. It dried out just perfectly as the sunlight beat down. It’d probably be a miracle if the equipment keeps working right. But if we can keep it running we’ll be done before tonight. The baler rolls the hay up tight. There won’t be no mold, ‘cause we cured it right. As the year goes on and the days turn cold, our cows’ll eat the hay the baler rolls. We raise hybrid bermudas: Russell & Tifton 44, two varieties that grow well on our well-drained Southern soil. When they get enough sun and rain through the summer they’ll really grow. We can usually harvest three times and if we’re lucky maybe four. The baler rolls the hay up tight. There won’t be no mold, ‘cause we cured it right. As the year goes on and the days turn cold, our cows’ll eat the hay the baler rolls. Our cows’ll eat the hay the baler rolls. This afternoon we mowed the last 13 acres of bermudagrass we'll harvest this summer. Ideally it would have been harvested about 10 days ago, but silage chopping ALWAYS takes precedence above any other field work on the farm. The hay will be a little on the mature side and therefore the quality will suffer a little bit, but our heifers and dry cows will be happy to eat it this winter. Even without the 50+ acres we lost to fall armyworms a couple of weeks ago, we've had a productive forage season with both hay/baleage and chopped silage. We still have a little fixing to do before we actually bale this hay. The tractor we generally rake hay with, a Ford 6600 (as made infamous here), will need its radiator repaired if we expect to use it. We also have a torn belt on our baler that will have to be patched or replaced within the next couple of days. The only other haying I foresee the season is a few acres of sudex we'll probably cut and harvest as baleage next week. After that, all of our field work will probably be focused on our fall-planted, spring-harvested cool season forage crops. If you would like to watch me talk about this week's haying instead of just reading it above, click "play" on our latest MooTube Minute below. Our farm's 2010 Edopt-a-Cow Program is now online with five cows available to choose from. Simply follow this link to the program's page on our website for a listing of the cows and links to their profile pages. Once you've decided which cow to "edopt", sumbit the registration form and we'll email an 8"x 10" photo of your selected cow along with a "Certificate of Edoption". Edopt-a-Cow is free, fun, and educational. Kids really enjoy the program, and many teachers have found it to be a great program to use in their classroom. I hope you'll all consider "edopting" a cow for your kids (or yourself), and please encourage your friends to do the same. Things have been busy, busy, busy lately, and when I've had time to blog I've been too worn out to do so. But, the coffee's flowing this morning and it's a few more minutes before I'll be throwing my bacon in the frying pan, so sit back as I give you a quick recap of what's been happening 'round here. I was in Chicago on Monday and Tuesday of last week for the first ever AgChat Training Conference. I was a co-presenter with Tim Zweber and Patty Leonard in a workshop entitled "Real Life Show & Tell" in which we each talked about some of the things we do (both online and "offline") to promote our farms and industry. Last Wednesday we began harvesting our bottomland corn. We made pretty good progress through the week, and the only major issue we had was with a flat tire on the dump truck. We weren't the only ones harvesting, though, as fall armyworms invaded the farm and ate up 52 acres worth of hayfield regrowth. We could have sprayed them, but decided it wasn't worth the time or expense considering we hadn't yet fertilized the fields. Instead of keeping up the momentum and continuing the harvest on Saturday like many farmers would do, we opted to park the tractors so we could go enjoy the opening of football season at Mississippi State. Dad and I took care of the morning milking duties and left the afternoon in the hands of our employees. We enjoyed over 6 hours of tailgating with other family members and friends before moving into the stadium for the 'Dawgs 49-7 romp over Memphis. Sunday was a Sunday. Milk, feed, church, milk, feed, done. Things got interesting on Labor Day. While everyone else has been harvesting, I've been taking care of all the other chores around the dairy. By the end of the day, I had two cows and two heifers to calve, I had to throw lots of refused feed out of the cows' trough (front-end of the silage pit stuff...not the best quality), and a cow stepped on my big toe and slammed me against the rails of our catch-pen when I tried to load her into our breeding chute. And to add insult to injury, I returned home to learn that my baby daughter had hidden the remote control for the satellite! Tuesday was much better. 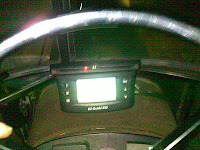 Harvest continued to run smoothly, dairy chores were much easier, and my wife found the remote. Things slowed down a bit yesterday. We should have finished harvesting, but our dump truck's transmission got stuck in 5th gear on just the second load. We had to tow it back to the shop (loaded, of course), and after attempts to locate a truck-for-hire failed we managed to get it to where it would shift between 2nd and 3rd. They limped along and managed to finish the day with 11 of the approximately 15 loads that remained in the field. So that brings us to today. Morning milking is obviously already over, and we'll soon be getting back to work. We have to catch one of the heifers that calved Monday, as she decided to break out of the milking herd's pasture and return to where she came from. After that, hopefully dad and the others can get the harvesting finished before lunch while I take care of feeding heifers and doing whatever else needs doing. With any luck, dad and I will leave things with the employees early this afternoon so we can get a jump on ballgame traffic. That's right, BIG game in Starkville tonight...Mississippi State vs. Auburn. Go 'Dawgs! 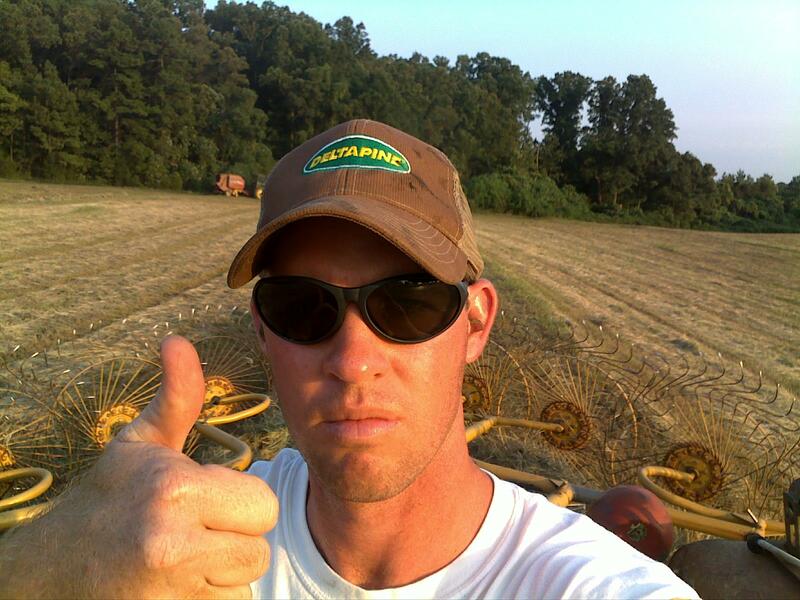 An article from the AgriBank Advocate newsletter about our farm's use of social media. A blog I posted to Farm Bureau's FBlog last night about the most memorable question I've ever been asked about a cow. Y'all have a "dairy" good day! 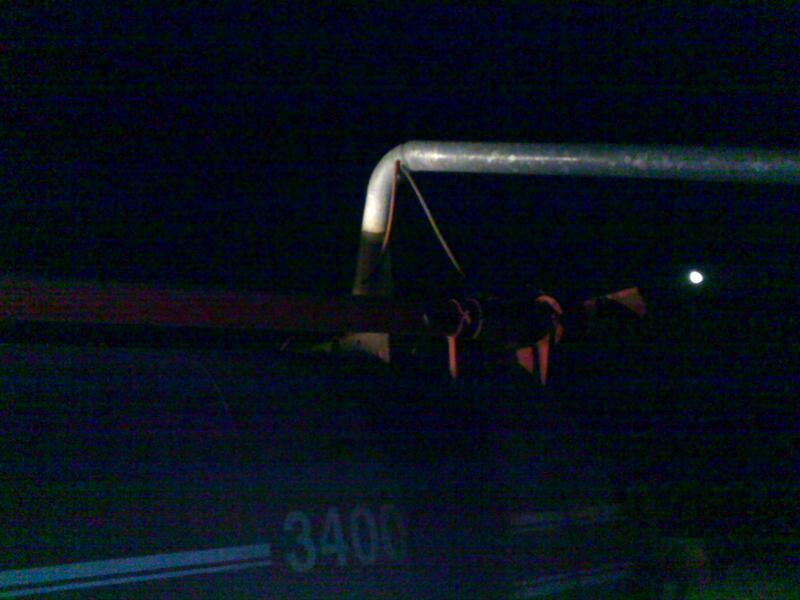 I pulled my first "all nighter" on my farm last Friday night, spending eight hours applying manure in the moonlight. Knowing in advance that I would be attempting something I had never tried, I smartly took a little time off from my regular work schedule and caught a couple of naps during the day. I started churning up the contents of our SlurryStore a few minutes after 6pm and was discharging my first load from the honeywagon by 6:30. Eight hours and twenty loads later, I called it a night at 2:30 am. I actually pulled into my driveway as my father was leaving his to go start milking our cows. There were several reasons I needed and wanted to spread this way. First of all, one of our recently harvested hay fields needed the fertilizer. Also, our SlurryStore was nearing its storage capacity and needed to be drawn down before we dedicated all of our "non-cow" time and equipment to corn harvest. The only access we have to and from our manure storage involves driving through our loafing barn, so by waiting until evening I gave the cows a chance to clear out and return to the pasture once the temperature had cooled. Finally, I really wanted to test out the demo GPS unit the Alabama Precision Ag team had sent me, and what better way than to use it in the dark? It worked great! I hit my target of one load (3000-3200 gallons) per acre, and completely covered the area of the field I was attempting to apply on. And, of course, I couldn't have effectively (or safely) applied manure in the dark if not for the unit's lightbar guidance and coverage mapping. So as of right now, the hay field's bermudagrass is green, the SlurryStore is half-emptied, and I'm buying into the thought that GPS technology is a viable tool for even small dairy farms like mine.